You ever hear the idea that it takes 21 days to form a habit? I’ll bust my tail for 21 days, form the habit, and then things like exercising regularly and budgeting my money will come easier to me. I put in the time, all 21 days, and was now ready to reap the rewards from the energy and effort I put into these 21 days. You can image my surprise when on day 22, exercising and budgeting were still a challenge for me. I still didn’t feel like getting up at 6AM to go to the gym or for a run. I still wanting to spend my money without thinking about it or budgeting. Especially on the weekends, like every weekend. $22 Old Fashioned you say? Sure, why not. Why was this still a challenge for me? I did my 21 days to form my habits of exercising regularly (5 days per week), and budgeting my money (daily, weekly, monthly). I’ve recently read a few studies that now say habits can take anywhere between 18 to 254 days to form. I’ve been exercising regularly and budgeting my money now for well over a decade. That’s 3,650+ days and guess what? Exercising regularly is still a challenge for me. 7 times out of 10 I’m still battling thoughts of “just stay in bed”, “go exercise tomorrow”. Budgeting is still a challenge for me as well. I still have a tough time controlling the urge to spend my money frivolously on things such as expensive old fashioned drinks or an adult moon bounce. It’s because of this I don’t believe in forming, creating, building (call it what you will) habits. I do however believe in committing to habits. Knowing that doing the things I must do to have the things I want, such as health and financial freedom, will never come easy. Regardless of how many days I’ve been at it. It’s a daily choice I make that requires me to be committed, focused, and disciplined. 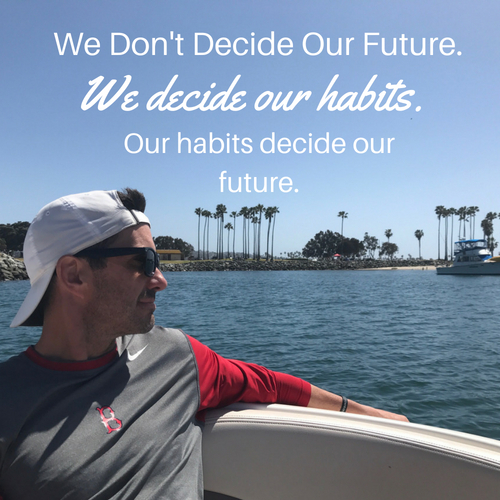 The idea we build habits over time, be it 21 days or 210 days, is false and one of the most misunderstood areas surrounding habits that I believe exists.